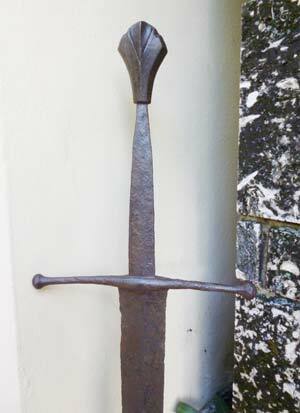 There have been a number of threads concerning the Castillon Swords, though most date from 5 or more years ago. I’d like this thread’s purpose to be the comparison of the originals to the modern reproductions or recreations based on them. Some of the modern versions are wonderful, some aren’t. 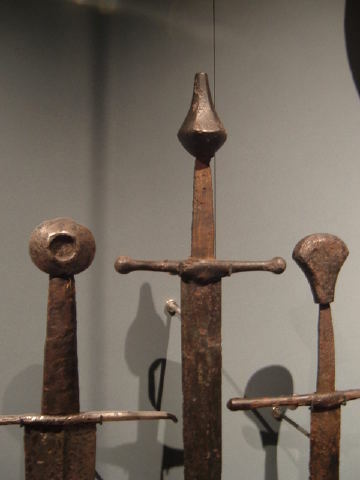 These swords were discovered in 1973, dredged up from the mud of the Dordogne River. Eighty were recovered, many in bad condition, and most disappeared into private collections. “That part of the Dordogne was the principal supply-route from the great English base at Bordeaux to the up-river castles which in the 1420s and 1440s were still precariously held by the English during the closing years of the Hundred Years’ War. They were evidently (or at least presumably) in a barge, which in some way was sunk, going up to Bergerac or Castillon with supplies. 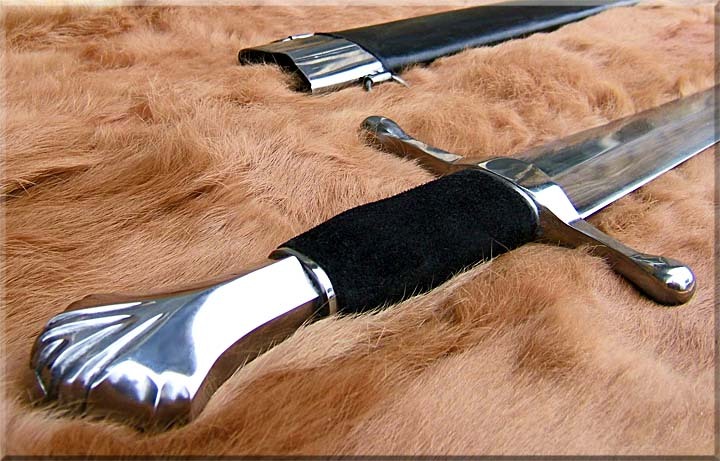 Below is a photo (seen on myArmoury a number of times) of a number of the Castillon Swords. Anyone who wants to put up and compare more photos of the originals and their modern versions, please do so. If anyone has a photo or information about the third sword from the right, the XVa with the V2 pommel (Records XVa.5), I’d sure like to see it. Many of these swords have already appeared on this forum, but it would be fun to put them all together in one thread. Let me start out with swords based on the 5th and 6th ones form the right, Records XVa.3 and XVa.4. 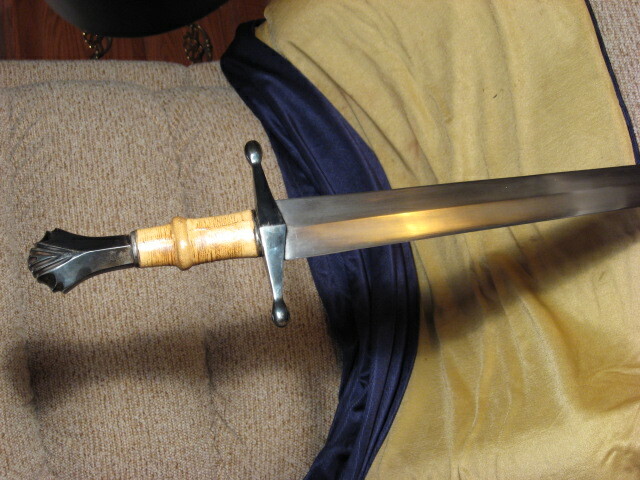 Below are some photos form Vikingsword.com, showing XVa.3. Albion, or course came up with the great Castellan. 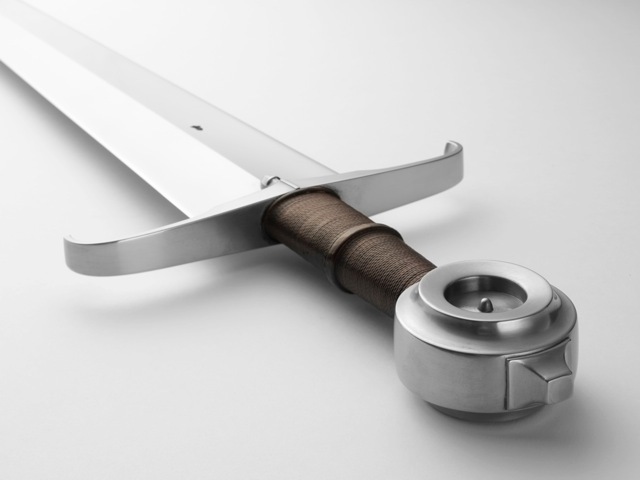 I have this sword, and have to say that this Peter Johnsson designed sword is a beautiful creation, worthy of the originals. Windlass Steelcrafts came up with their own version in 2004, now discontinued. The photo shows a number of liberties. I don't know how good a sword it was, but it certainly wasn't in the same league as Albion's creation. Of course, it was also much cheaper. 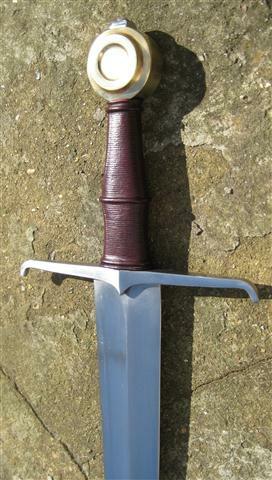 Edited to add a couple more photos of XVa.4 (I think its the same sword) that I found in a Hermann-Historica 2011 auction. Note that the modern grip has disappeared. 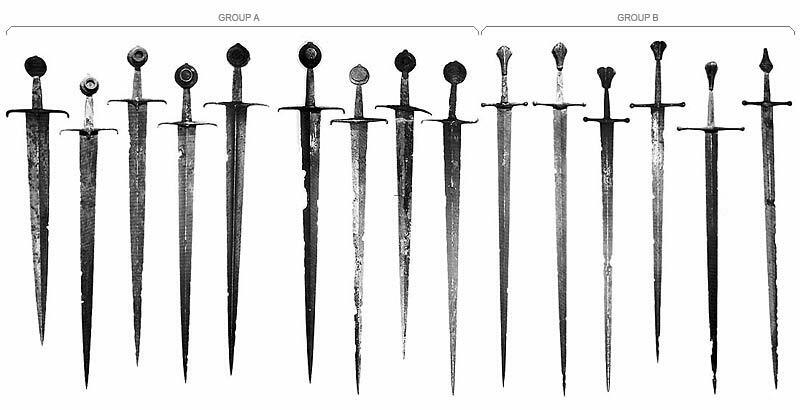 In group B in the above multi-sword picture, the one on the far right is a type XXa (Records XXa.2) It is currently in the Royal Armouries at Leeds - IX.2226. 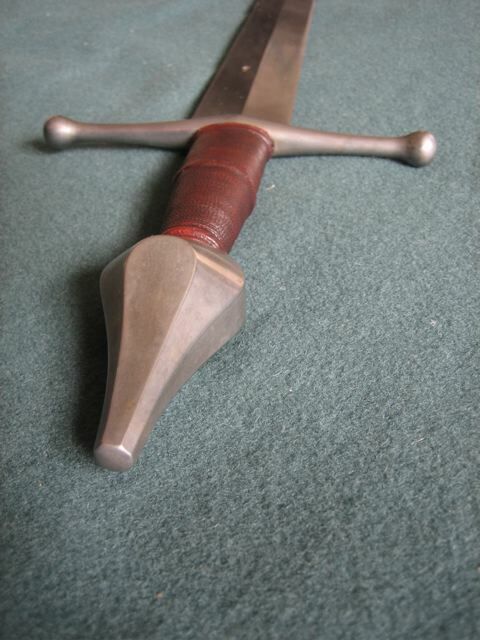 Peter also made a version of this hilt a few years ago with what looks like a XV or an XVIII blade. If anyone has a photo or information about the third sword from the right, the XVa with the V2 pommel (Records XVa.5), I’d sure like to see it. Me too ... anyone have a copy of Stuber & Wetler? 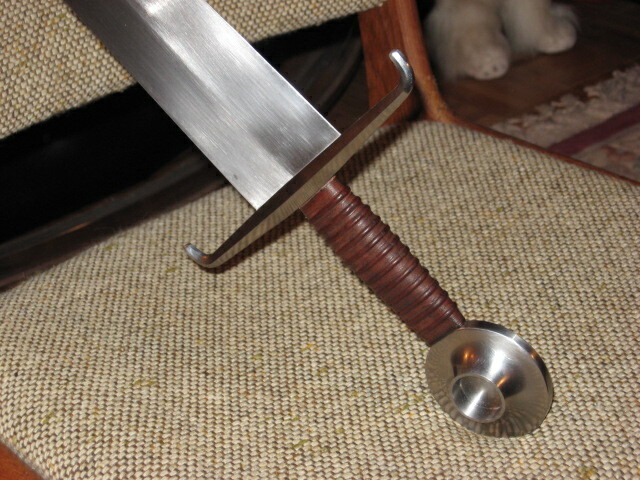 Below are some photos form Vikingsword.com, showing XVa.3. Anyway, great thread, and I look forward to seeing both more on the originals as well as some repros! Castillion repro by Michael Pikula, these pics where shown before in an informal review by me but a few of them shown here to add to this thread seems useful. 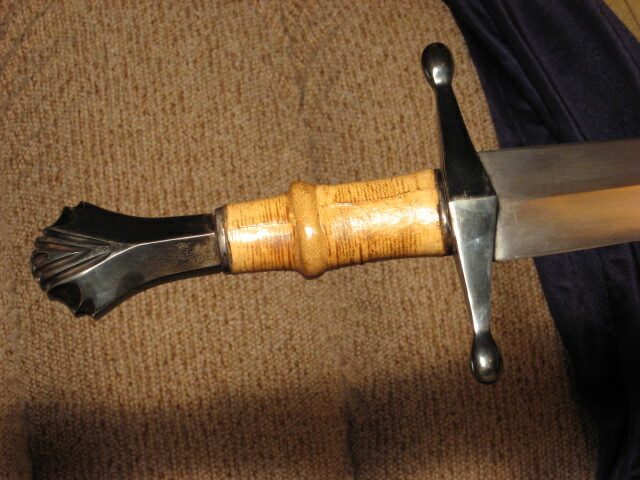 For the 2011 PArk Lane Arms Fair, I made a replica of one of the group A swords of the find: one of the short and broad ones. 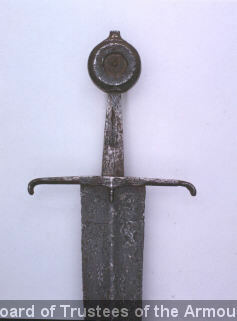 It belongs to the collection of the Royal Armouries in Leeds but is now on loan to The Frazier Historical Arms Museum. 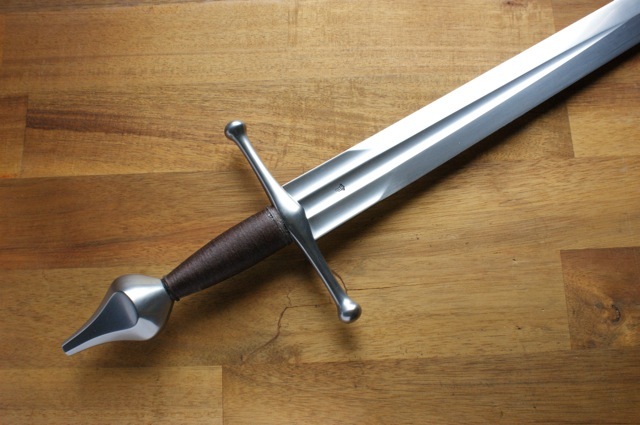 Oakeshott published it in his Records of the Medieval Sword as one of the type XV swords I believe (my books are mostly still hidden away in boxes after moving to the new house, so I cannot access "Records" at the time of writing). The edges are tapering in mostly a straight line for most of the length, so that would make it a type XV, but the blade screams *cutting* in a way that you otherwise see in some type XVIII blades. 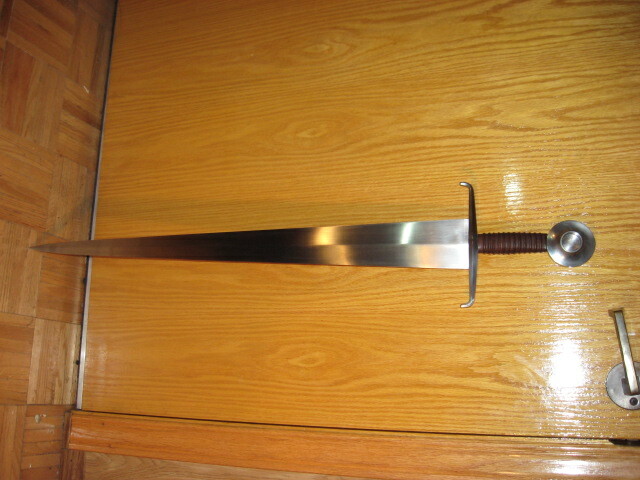 As with other swords of this type, it is pretty hefty (not light weight) but also compact, powerful and agile. 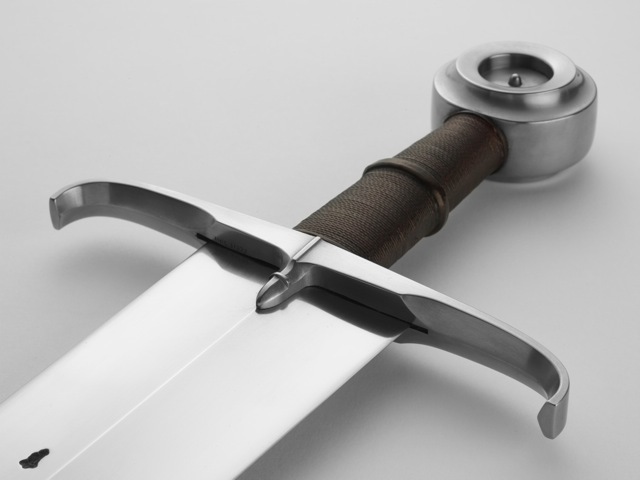 A grim and serious sword that really means business. 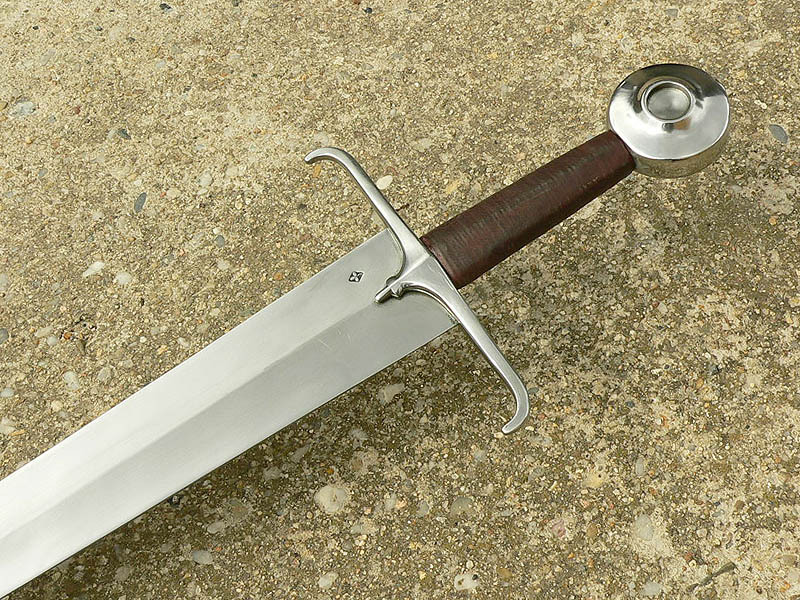 The slightly angular and boxy design of its hilt components stress this character of the sword. At the same time there is a lot of subtlety involved in its proportions. The design is a beautiful example of masterful application of gothic design principles. To me it was awe inspiring to study the original and the process of recreating the weapon in my smithy was very much a learning experience. 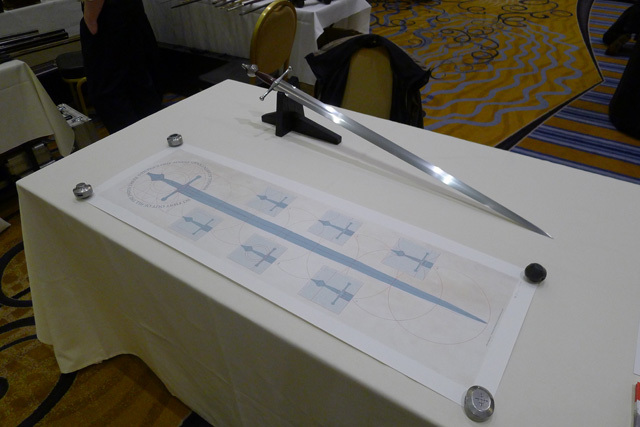 The study of its proportions has added in an important way to my ongoing research of medieval design methods for swords. 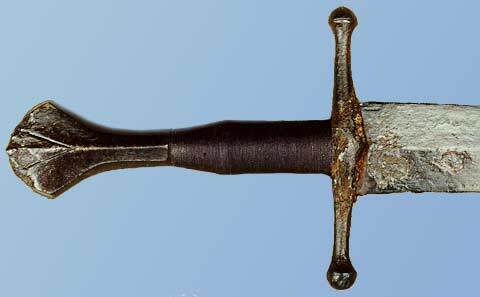 I hope to be able to present some results of my studies of this and other swords in a publication in the future. I cannot add much more detail here at this time, even though I am dying to share what I have seen. 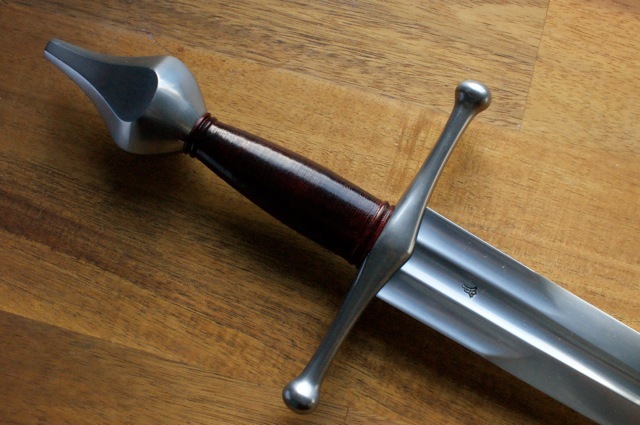 It is a fascinating group of swords that is revealing to how medieval craftsmen and swordsmen thought about and found important in swords. You're right, that was a typo - I really meant to write XVa.4. 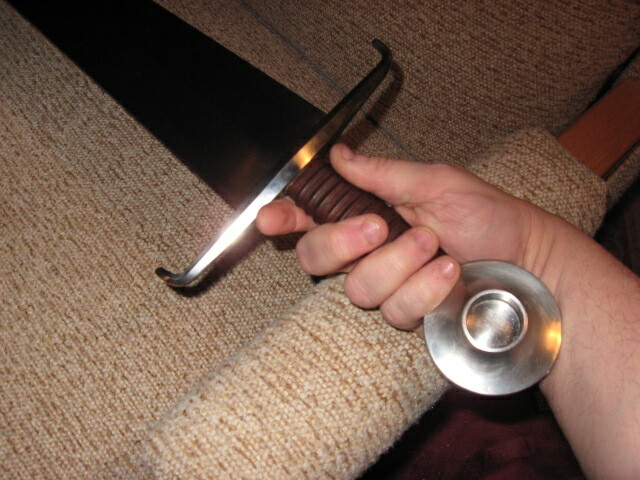 The picture of it in Records looks gripless, but the grip in the Vikingsword photos looks suspiciously new. Also, I believe that conservators sometimes repair or fill in the bigger nicks on the blades. 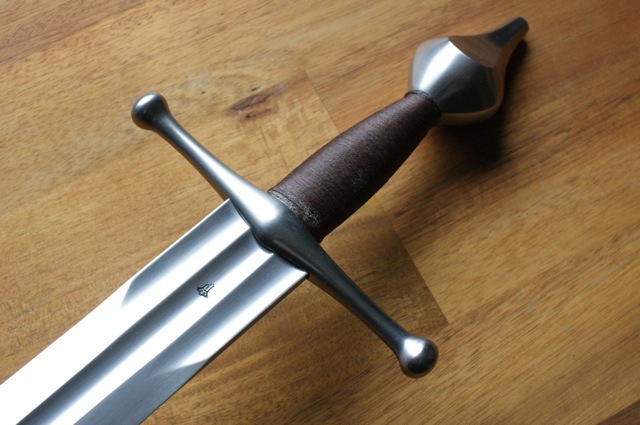 I think that Michael Pikula's and Peter Johnsson's 2011 Park Lane swords are based on Records XVIII.6, AKA Royal Armouries IX.3683. I found a pictire of the original at Arma Bohemia and also at the Royal Armouries. It looks like somebody filled in that big nick that is present in the Records photo. Below are photos of Arma Bohemia's version and some more pictures of Michael Pikula's vision. 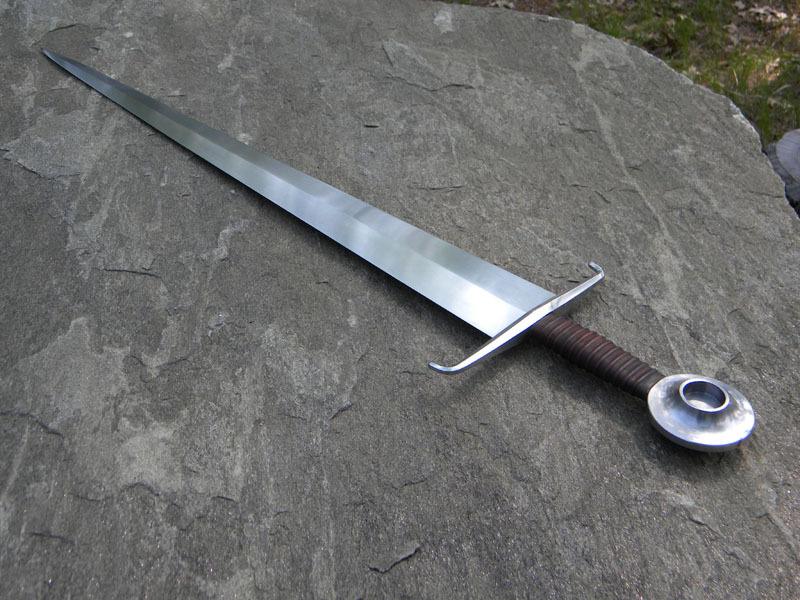 The Generation 2 Dordogne sword, based on Records XV.2 - the fourth sword from the right in the first photo in this thread. This model was made under the aegis of hank Reinhardt, based on an outline traced by Ewart Oakeshott. I thought that XV.2 was an intriguing sword, a singlehander with a 36 inch blade. It must have been designed for half-swording. I was looking forward to this reproduction, but didn't like its appearance. 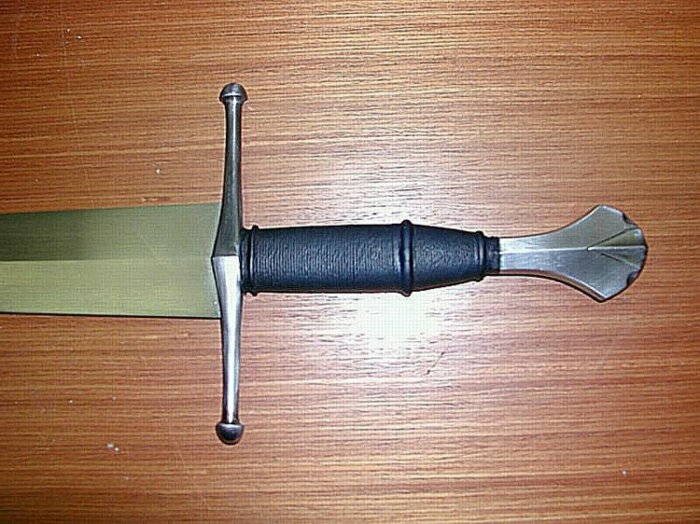 The hilt looked half melted, the pommel had been changed from the original V2 type, it had a really ugly suede grip, and it looked way too shiny. Jean Thibodeau owns one and gave it a mixed review back in 2007 - see HERE - What do you think of it now, Jean? 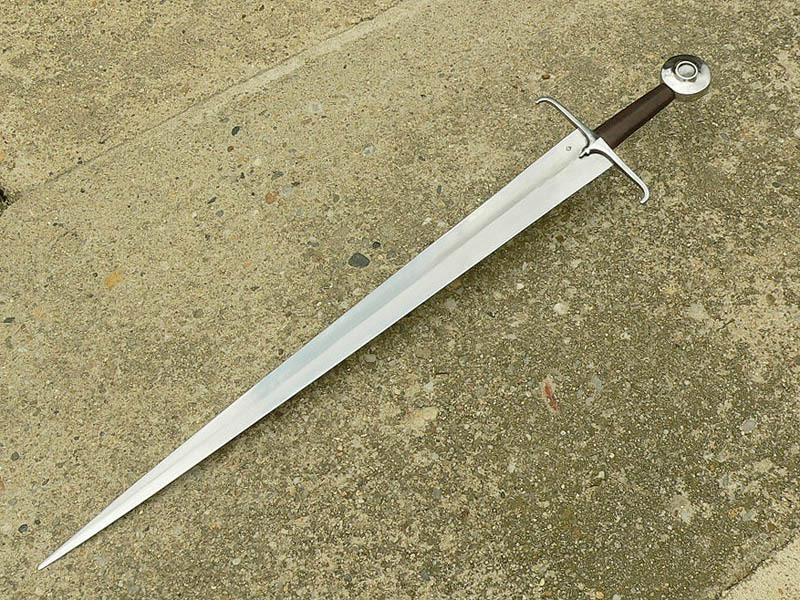 Others over at Sword Buyers Guide have like it a lot. I hope someday that XV.2 is recreated again. 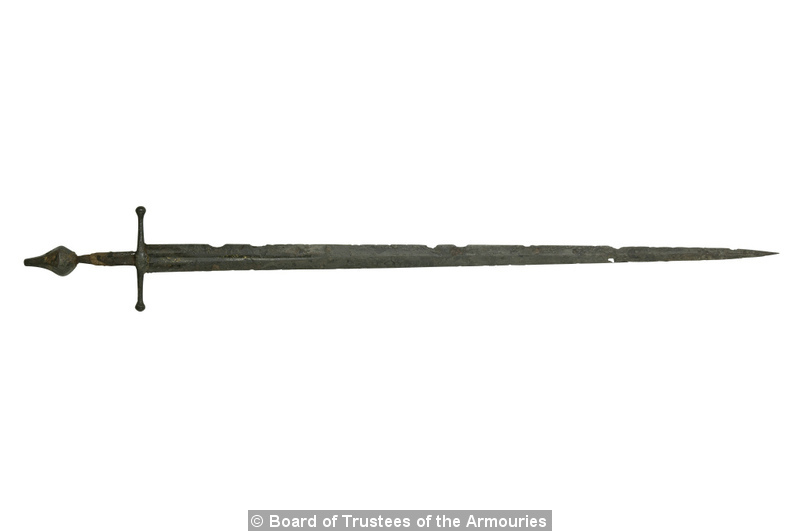 I am pretty sure that Records XVIII.6 and Royal Armouries IX.3683 are not the same swords. The most obvious difference is the cross. 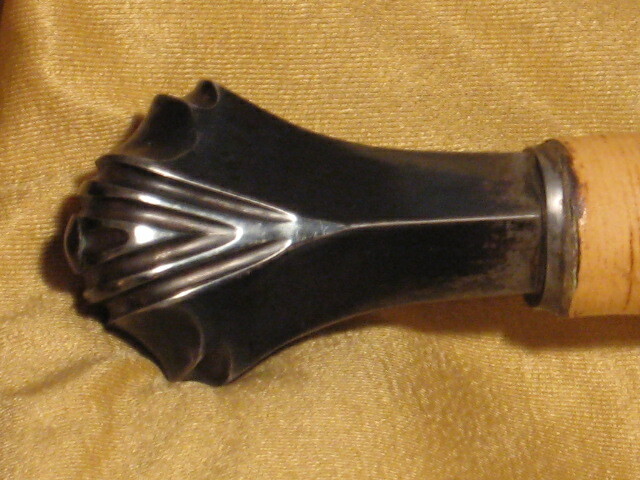 Records XVIII.6 has two "lines" on each side of the central "acorn" point which does not appear on Royal Armouries IX.3683. It might be the picture in the book, but the blade of Records XVIII.6 appears less triangular and its tang slightly broader. Here are a pictures of the bot side of the cross of Royal Armouries IX.3683 and one of Records XVIII.6. 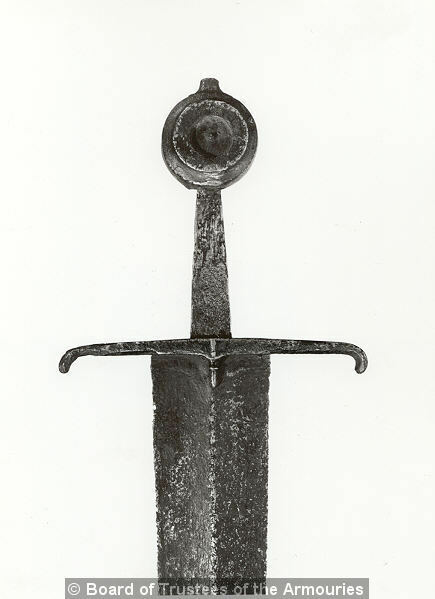 Oakeshott does say in Records of the Medieval Sword that XVIII.6 is from the Royal Armories at Leeds collection. If it isn't IX..3683, which one is it? There are about 200 swords in their on line collection, but there are probably a lot more that aren't shown there. 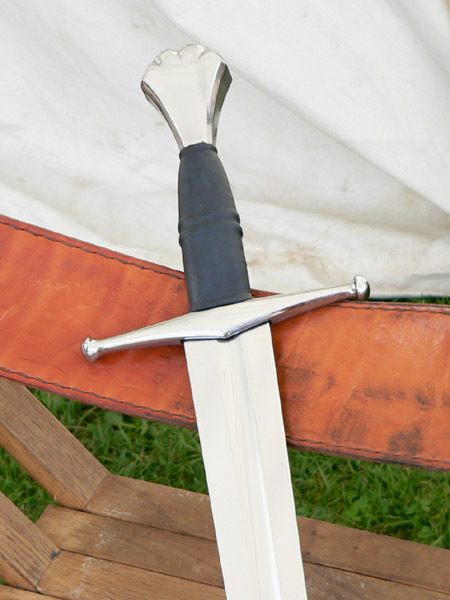 The below sword was made for me by St Georges Armoury (Marc Vickers), borrowing several features from the castillon group A swords. 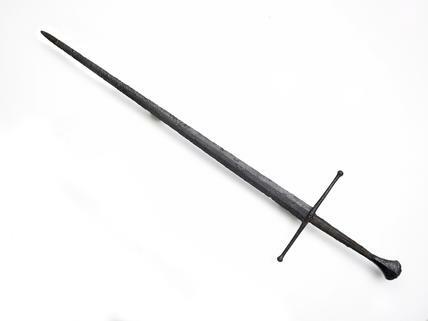 On a side note, the Latest London Park Lane Arms fair catatogue (2012) contains a very extensive article about the castillon swords. Mathieu is right : Records XVIII.6 and RA: IX-3683 are not the same sword. The terminals of the cross on IX-3683 are not symmetrical whereas they are on XVIII.6 and the tang is broader on XVIII.6 (as Mathieu noted). Also Oakeshott records it as 'on loan' to the RA which means it would not have a IX number (the indication of the permanent collection). But then can we be sure that it is in the RA? 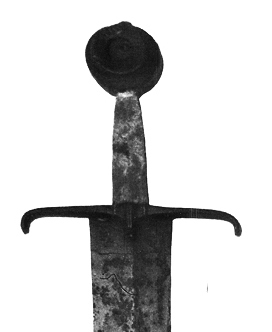 Oakeshott was notoriously careless in checking his references - for this sword he writes that it is published in Dufty's 'European swords and daggers in the Tower of London' (ie the Royal Armouries as it is called now), but it is not, hardly surprising since the book was published in 1974 the same year the hoard was discovered and 3 years before it became at all well known, from the Christie's sale in 1977. Just my bit. Keep the examples rolling in. Arma Bohemia's EP27 has a photo of the original that it is based on (Arma Bohemia includes a photo of the original for many of their models - applause!). This one is a type XV residing in the Chateau Grandson museum in Switzerland. 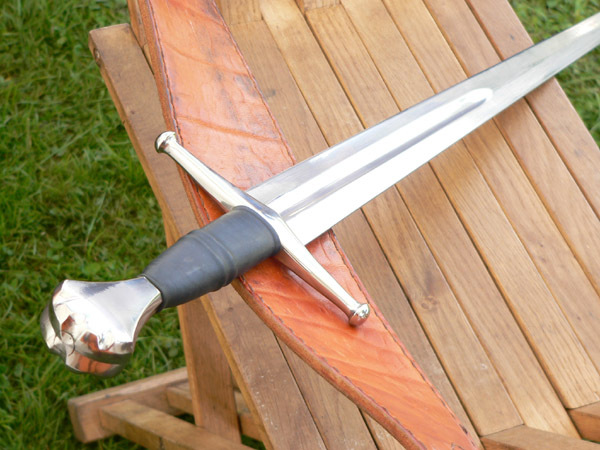 It is very unlikely that it is one of the swords dredged up from the Dordogne back in the 1970's, but it certainly looks like it belongs with them. 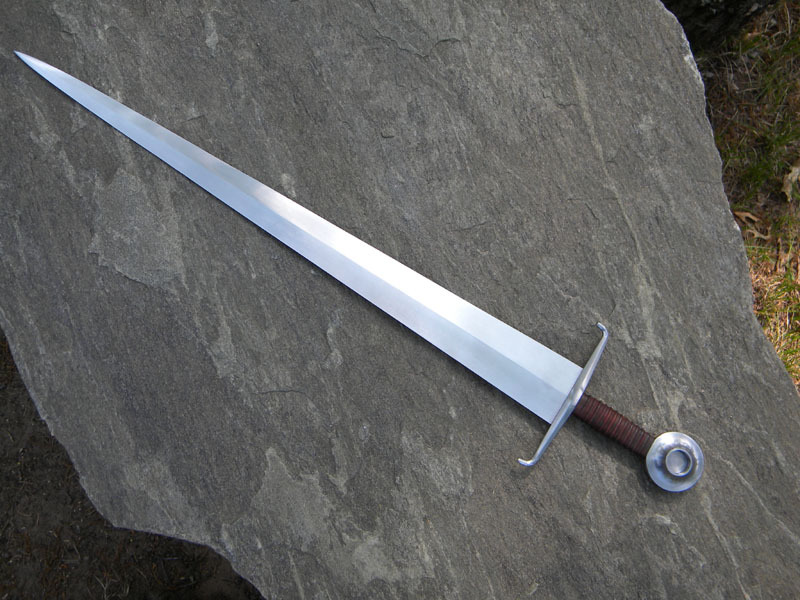 I dub it an honorary Castillon Sword. 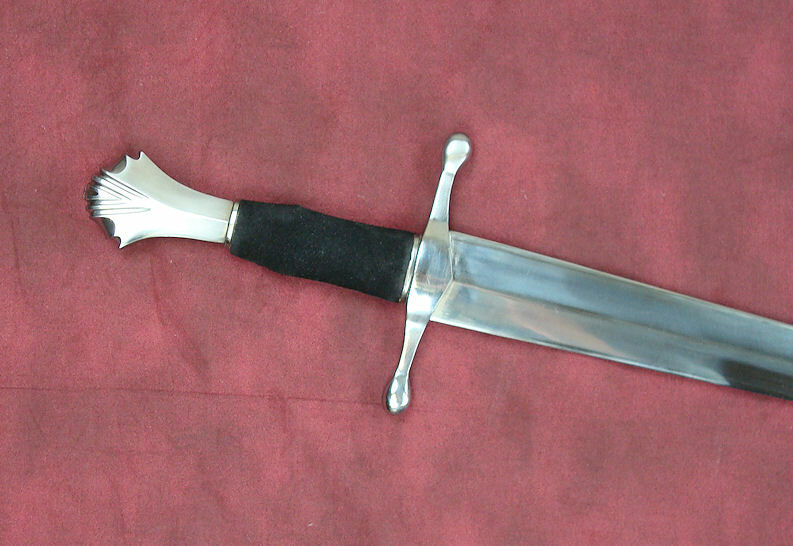 Here is another discontinued Windlass Castillon sword. Since they've taken so many liberties, I can't say which original it is based on. BTW, the advertising blurb says that the Battle of Castillon took place in 1431, not 1453. I actually like it a lot after I upgraded it. I just took pics and added them to the Review Topic. I put a few here on this Topic to have more pics of these swords all grouped together here, but there are more pics on the Review Topic. 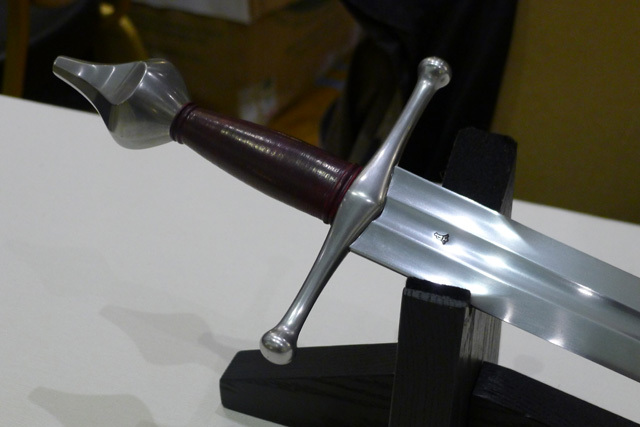 Mixed review maybe, but it's a very robust sword with a good heat treat. Yes it has a great deal of presence but I've learned to appreciate fast and nimble but also swords with a great deal of presence. 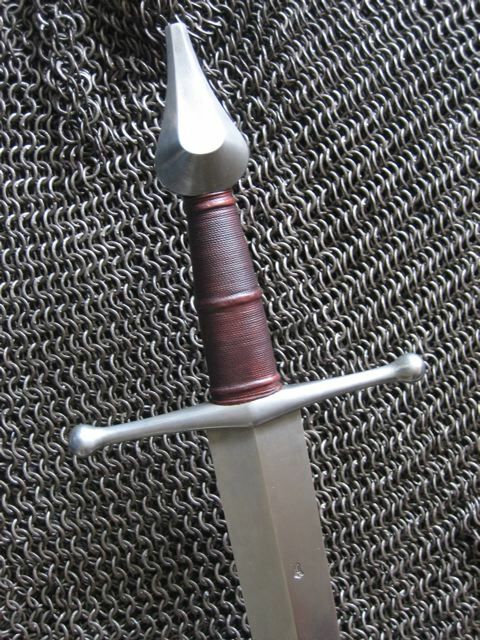 I find that if I hold the pommel I can use it as a very short handled longsword and it would certainly work well in half swording" Not nimble but not hopelessly slow either. Here is one of three daggers found in the Castillon haul. This one has an overall length of 59.5cm. It was in the Hermann-Historica May, 2011 auction. Pictured below with Records XV.a.4 (I think), which was also in that auction. Here are a few photographs of some more originals. I'm not sure that the first two pictures are of a genuine 15th century sword..
Hi guys, you need to look into back issues of the Park Lane Arms Fair catalogue - they are available to buy online. 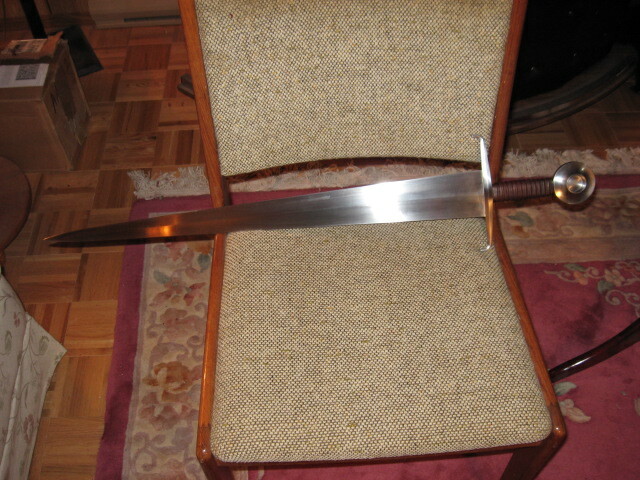 They contain years worth of articles and photos of these swords, including a whole load by Oakeshott. As Julien mentioned, the most recent issue contained a summary of all those that went before, but the older articles contain lots more photos and measurements.